I made a bit of a fool of myself (ok, a bigger fool of myself) during that pulsating game yesterday by declaring my love on line for Harry Kane. I am a bit long in the tooth to be coming out, but I would willingly have given him a big man hug following his man of the match performance against Everton. After the magnificent opening goal from the Merseysiders, it needed a Tottenham player to grab hold of the game by the scruff of the neck and shake some life into it. Step forward Our Harry, He�s One Of Us. He played with something I feared had been lost by this current team � good old-fashioned Spurs spirit. Call it the Kane Mutiny. My fingers are actually dancing on the keyboard as I type. A sure sign that I was entertained by an exhilarating match that showed the Beautiful Game in its finest form. No idiots invading the pitch, no witch doctors cursing the players and no need for Axeman Levy to sharpen his blade. There was not a dull second, and so much of it was down to Hurrikane Kane. Everton struggled to control his bullocking runs, and he made such a mess of their defence that Christian Eriksen was able to coolly plunder a vital equalizing goal. Suddenly Bobby Soldado found that because Kane was raising Cain he had more room in which to operate. The result was that he did what used to come so naturally to him, finding the net with a winning goal that was greeted with undisguised delight by all those of us who have stuck with Bobby through thin and thin. It was Kane�s exuberance and enthusiasm that went through the Tottenham team like an electric shock, and after so many disappointing home defeats we were at last able to wallow in the luxury of a win against an extremely efficient Everton side. We have watched Harry growing from a raw novice to a polished professional, welcoming him back with open arms after his learning-experience loan runs with Orient, Millwall, Leicester City and Norwich City. He is still only 21, has a cupboard full of schoolboy, youth and Under-21 England caps. The way he is improving it is surely only a question of time before he plays for the full England team. There are more skillful and more cunning players, but Harry is nearly the complete package because he has a lot of everything in his game. Most of all he has a heart bigger than his head, and is a team player that never gives anything less than his best. It was hardly a one-man show against Everton. This was a victory for the team, with the midfield quartet putting in a huge shift, and the back line looking more solid that it has all season. If the talented Vertonghen would show this sort of total commitment in every match he would save Hugo �Boss� Lloris from having to carry the extra responsibility of captaincy. All in all a thoroughly uplifting performance, even if the last ten minutes put ten years on me. It will be fascinating to see what team Pochettino selects against Chelski on Wednesday. I cannot see him playing two men up front at the Bridge, and it would not surprise me to see Our Harry temporarily relegated to the bench. I have no great expectations against a side that is a class above all the opposition this season. So if we can come away with anything it will be a bonus. But at least (and at last) the Spirit of Spurs is burning again, thanks to the Kane Kid. Don�t you just love the boy! THE book, part Spurs history and part examination for quizzical White Hart Lane supporters, was inspired by readers of my weekly blog on what many consider the No 1 Tottenham Hotspur website, Spurs Odyssey . 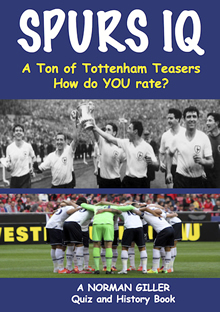 I set a regular �Giller Teaser� and several who take part in the competition have told me they would like a book of teasers to test their all-round knowledge of Tottenham Hotspur. So here it is! I have called it Spurs IQ, because it gives a thorough test of your memory and know-how of all things Spurs and also serves as a journey � even an odyssey � through the Tottenham ups and downs of the eventful post-war seasons. Hopefully, as we go along, you�ll learn a few things that perhaps you didn�t know about the club and its managers and players. I have raided my Spurs scrapbooks, kept as a young supporter from the 1940s and then as a reporter writing about football for my daily bread. This is the 98th book that I have foisted on the great reading public, and I could not have done it without the photographs given to me over a course of many years by late, great Fleet Street cameramen Monte Fresco, Norman �Speedy� Quicke and Bob Stiggins. They knew of my leaning towards Spurs and used to regularly slip me spare copies of their gems. The Tottenham Teasers are running throughout the book, with the answers at the foot of the following page, so be careful not to peep! Keep a check on your answers, because there is a Spurs IQ ratings table at the end that will give you a measure of your knowledge of the club, along with a Spurs IQ Masterclass test on the Legends of the Lane. And please remember that I am making a donation for every book sold to the Tottenham Tribute Trust that looks after our old heroes who have hit difficult times. These were the players who missed the gravy train before football became a passport to huge riches. I hope you will show true Spurs spirit and give your support. As you will know, each week here in my Spurs Odyssey home I test your knowledge of Tottenham. Last week I asked: Who scored 12 goals for Spurs in European competition, netted four goals in a Premier League match against Reading and scored from the penalty spot in a League Cup final victory at Wembley? Most of you got it right, Dimitar Berbatov, the mean, moody and often magnificent Bulgarian for whom the grass was greener at Old Trafford. I would loved to have seen him at the peak of his power playing alongside Harry Kane! The first name chosen at random from the correct entries: Jim Vaughan, an Edmonton-born, Grimsby-based Lilywhite who wins the autographed copy of Lane of Dreams. This week�s teaser: Which goalkeeper captained Tottenham in two matches, and once scored a goal against Watford? He won 41 international caps.